Engineered for the comfort of our guests, the Hotel Indigo Raleigh Durham Airport at RTP hotel offers a perfect stay near RDU Airport, Research Triangle Park and local universities like North Carolina Central University, Duke, University of North Carolina and North Carolina State. Our Cedar Fork Bar & Bistro serves up fresh, locally inspired cuisine, and the Boardroom is smartly designed for 12, while our stylish 1,400-sq-ft ballroom is suitable for larger gatherings. 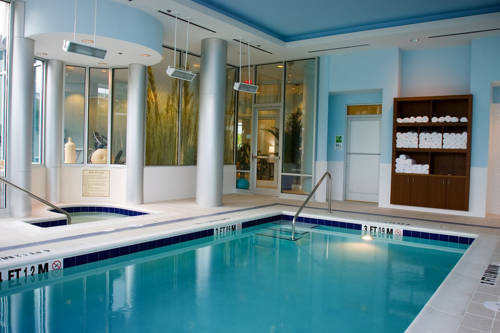 Our hotel features an indoor heated pool, whirlpool, and mediation court, with free Wi-Fi access available everywhere. Hop on board our complimentary shuttle to and from the airport and RTP. Cedar Fork Bar and Bistro: An eclectic experience, Hotel Indigo's restaurant and bar offers a variety of menu items, including local dishes inspired by a local culinary program. Angus Barn: Fine Dining, Wine Cellar and Cigar Room. The legendary steakhouse is a must if you are in the Raleigh Durham area. Reservations are recommended. Mez Contemporary Mexican: Closed for lunch on Saturday and Sunday. Gourmet. Fine Dining. Reasonable prices. Rookies Sports Bar: Great place to watch the game. Carolina Ballroom: Carolina Ballroom can accommodate up to 100 people banquet style and can be broken down into 2 seperate meeting rooms if need be. Boardroom: Private boardroom with seating for 12 around a stationary table. Quiet and intimate with private balcony. Brier Creek commons 800000 sq ft open-air shoppingConveniently located at I-540 and Highway 70, Brier Creek Commons is your destination for an ultimate shopping experience, choice for great movies, or fun activities for all ages. Stores range from Barnes & Nobles, Clothing stores and many restaurants.